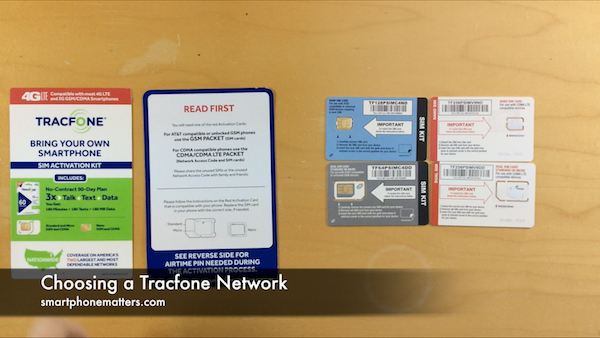 In this video I talk about how to choose between Tracfone’s AT&T GSM LTE network and Tracefone’s Verizon CDMA LTE network. In my last video I opened the Tracfone Bring Your Own Smartphone Activation Kit and reviewed the contents. Some of you may be wondering whether to choose Tracfone’s AT&T GSM LTE network or Tracefone’s Verizon CDMA LTE network. Click the link below to order a Tracfone Bring Your Own Smartphone SIM Activation Kit From Tracfone. In most cases, Tracfone is expecting customers to be bringing a smartphone they already have been using one one of the big four networks: AT&T, Verizon, Sprint or TMobile. The expectation is you would be using your current phone phone on the same network. So if you have an AT&T or TMobile phone you would choose the Tracfone’s AT&T GSM LTE network. Any AT&T smartphone should work regardless of whether its is locked or unlocked. If you have a TMobile phone it should also work on the Tracfone AT&T network if the phone is unlocked. If you have a Verizon or Sprint phone you may be able to use it on Tracfone’s CDMA or CDMA LTE network. In his case you’ll need to go to the Tracfone website and check the MEID of your phone to see if it is eligible for use. If your phone is eligible you can use it Tracfone’s CDMA or CDMA LTE network. But some people want to use Tracfone and are going to buy a new or used phone. In this case I recommend pick the network with the best coverage in your area and then buy a smartphone that works on that network. Ask your family, friends, coworkers, or neighbors whether they use AT&T or Verizon and how well the network works for them. In the US, some areas both networks have great coverage, but in others either AT&T or Verizon is great and the other isn’t. Once you choose a network, buy a phone that will work with that network. If you have any comments or questions, leave a reply below. So if i buy a used unlocked AT&T iphone 6 it will work with tracfone? It’s great of you to take the time to help answer questions about bringing an iPhone to Tracfone. I have the opportunity to buy a Verizon iPhone 5S from my workplace. The phone is no longer under contract. I want to set it up for my grandmother as a Tracfone. On the Tracfone website, I clicked that I was bringing a Verizon phone. When prompted, I entered the IMEI, and then the website asked me if I needed to purchase a Tracfone SIM card and what zip code it would be used in. I entered the zip code and received the error “There is no coverage in the zip code you provided.” I backed up and chose AT&T as the network, and I entered the zip code and was taken to the option to purchase a BYOP SIM card for AT&T. Which brings me to my question. Since the AT&T network appears to be available in my zip code for Tracfone, can I use this (formerly) Verizon iPhone 5S as a Tracfone running on their AT&T compatible network? Yes you can use the phone with the TF ATT network. You can also do an online chat with tracfone and ask them to check the MEID if you prefer the Verizon network. you can also buy those SIMs in Best Buy or Target for $1. Don’t pay too much for that iPhone 5s. A brand new Straight Talk iPhone SE is $129 and mine works with Tracfone’s ATT network. What are they asking for the iPhone 5s? Hi, your articles are great! However, I just want to make sure I understand the process of BYOP to Tracfone. My two daughters and I have used Tracfone service with phones purchased directly from Tracfone for several years now. They are now teenagers wanting an iphone. So for Christmas, I purchased two refurbished iphone 6s phones directly from Apple and chose the SIM free option when asked about a carrier. Verizon is the service that works best in my area. My question is, do I need to purchase a SIM card first to get them set up? When I visit the Tracfone website and go under the BYOP section, it asks what carrier my phone works with. If I chose the “I have an unlocked GSM phone” option, it appears it wants to sell me an AT&T or T Mobile SIM card. I want a Verizon serviced option so should I just choose Verizon right from the start, even though my phone isn’t tied to any carrier? I thought the fact that I purchased it unlocked and SIM free meant I could choose whatever carrier I want. So is it correct to assume I can buy a Verizon SIM card and it will work? I love Tracfone service and pricing, but loathe their customer service. Talking to people I have a very hard time understanding is not fun and usually ends up a couple hour conversation. My goal is to transfer both my daughter’s current phone numbers and call/text/data bank balances over to these phones. Any advice or tips you have is greatly appreciated! You pretty much understand it. Go to tracfone.com and shop for Bring Your Own Phone, choose SEE IF YOUR PHONE WILL WORK WITH TRACFONE, and choose Verizon compatible. check the MEID of each phone to make sure it can be used on Tracfone’s Verizon network. They should be. At that point you can order two SIMs online or visit best buy or target and buy the $1 SIM card kits. At that point you’ll be ready to transfer their service. I have a lot of videos about this on my YouTube channel. Check out those videos. If Tracfone says the phones are not eligible, call them or check via online support, sometimes the website gets it wrong. As far as tips, I’s say make sure you have tracfone.com accounts set up before the transfer. And If I recall when you complete the transfer to the new phone / SIM combo, there is a button activate it in the online account. After you set up the phones you’ll need to install the APN profiles on the phones for data / picture messaging to work. If you need more help or have any questions let me know. Nice Christmas gifts for the girls they will be excited! Jennifer Jennings – How did you purchase refurbished iPhone 6s from Apple? At a store? Online? That’s the phone my teen wants, too, but I’m not finding online with Apple. You can find refubished apple products here https://www.apple.com/shop/browse/home/specialdeals Not all models are in stock at any given time. New iPhone 6s start at $449.00. What carrier do you want to use? Thank you Bob for full details on bringing a iPhone to tracfone. I have been with trafone using their phone for many years and now want to buy an iPhone. Used or new was hoping iPhone 7 Plus and because I live in Mississippi of using att service it works better in the state. My first thought was to buy from Amazon but want to know if the will compatible with tracfone. Talked with tracfone and was told to bring an att or Verizon phone. So read your article and feel it okay to buy a phone from amazon. If so or not please let me know. And anything needed. Thanks and very appreciated of your help. You are welcome. Getting the right iPhone isn’t difficult. But tell me are you looking to buy new or used? If you are buying new you can order the SIM-Free model directly from Apple and it will work with tracfone. Be advised, Apple is expected to come out with a new iPhone in September which may be a major update. At that point it is possible to see the price of new and used iPhone 7 drop. And of course you could buy a the new iPhone too. Let me know what you want and when you want to buy and I can give you some advice. Your articles are so helpful! I want to upgrade my smart phone Tracfone to an iPhone. I did see a iPhone SE that I liked, but now on the tracfone web site, it is unavailable, nor any other iPhones. My present phone uses CDMA. How do I even shop for a iPhone that will work in the BYOP? Note if you want to use the tracfone verizon network you’ll need to check your new iPhone’s serial number with tracfone to make sure its eligible. It should be. If on the off chance there is a problem you can return the phone to apple. my lte tracphone’s mobile network is shut off. How do I turn it back on? I have no internet access unless I am in a wifi area. If you used up all your mobile data, you’ll need to buy more. It’s also possible that you just need to set the APN on your phone. How you do that is different depending on your phone and which tracfone network you are using.